On January 23, 1943 officials from DuPont and the Corps of Engineers met to determine where to build a facility to produce plutonium for the bombs that were dropped on Hiroshima and Nagasaki Japan to end World War II. This facility was part of the Manhattan Project. Because of this decision the towns of Hanford, White Bluffs, and part of Richland Washington were acquired so that this secret facility could be built. During February and March of 1943 the Corp of Engineers decided to establish a “village” that encompassed the existing town of Richland which had a population of 250 with an infrastructure of a civic and commercial center. It was situated along an old county highway and a scattered pattern of residences, established farms and orchards. All of this land was acquired through the process of condemnation. Most of the farm land was already owned by the irrigation district because the farmers could not support their farms. Richland was selected because it was close enough to Hanford for easy commute, yet far enough away for safety and security reasons. The homes to be built were to house most of the workers at Hanford. 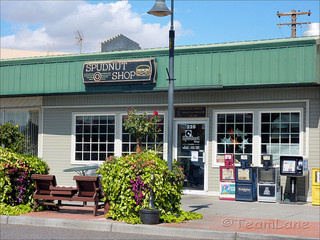 In March, 1943 DuPont and the military contracted with Gustav Albin Pehrson of Spokane, Washington to furnish the engineering and architectural services to build the “village” of Richland Washington. Pehrson started work in mid-March and was required to furnish the plan and specification for an initial duplex type house within one week. He also needed to furnish the plans and specifications for the housing of initially 6,500 people and eventually 12,000 and the plans had to be ready in two and one half months. Construction of Richland “village” was started in late April. The first housing unit was completed in late July, 1943 and under intense pressure, work continued until early 1945 and the project was not considered finished until June 1945. Much of the framing lumber for the houses was made of high quality Douglas fir that came from the area of the 1929 Tillamook burn in Oregon. Because this was a government project G. A. Pehrson was required to submit a report to the DuPont Corporation describing the general features of the village. The report he wrote was modeled after a report prepared for the Clinton Engineers Works Village at Oak Ridge, Tennessee. Pehrsons report was submitted in November 1943 and documented the previous six months work. This report described the existing conditions at the town site, the background a nd basis for the design of the entire village, and identified the problems encountered in the process. The most difficult problem that faced the planners was the fact that most of the information about the project could not be revealed. They would not be allowed to know anything about the future use, ownership, or any other information about the reasons for the village being built. G. A. Pehrson ran into problems when he had to determine what existing buildings could be used as part of the new town he was building. The main problems being that some of the residences had electricity but most did not have sewers or indoor plumbing and water came from individual wells. Of the 185 existing buildings only 75 were determined to be usable. Because of other determinations only 26 of those were retained for use. The design of the village tried to follow the existing land contours and tried to save the existing trees (cottonwoods, willows, and black locust trees) and old fruit orchards. When the final Richland housing plan was determined it was decided to identify the different housing units by the letters of the alphabet. “A” houses were three-bedroom two story duplexes, “B” and “T” houses were two bedroom single story duplexes, “C” was also a single story two bedroom duplex with a different floor plan. “D”, “F”, “G”, “L”, and “S” were two story, single family houses with three to four bedrooms with different exterior designs, houses “E”, “H”, “K”, “M”, “Q”. “R”, “U”, “Y”, and “V” are all single family one story homes with different exterior designs, “J” buildings were built as dormitories for the single female workers, “K” buildings were dormitories for the single male workers. The buildings designated with the letter “I” were single bedroom 8-plexes, but were never built because it was decided to put in prefab housing that was faster and easier to put up. There were three styles of these prefabs ranging from one to three bedrooms for the new Richland Washington Real Estate. In determining design criteria of the ABC Houses considerations were made for the relocated families. The considerations looked at were: the occupational and social-related needs of executives along with the needs of the less senior employees and the opinions and needs of the relocated housewives. A total of 4,732 dwellings were built for Hanford workers, of this number a total of 1,804 were prefabs. Considering that building did not start until April 1943 and was finished in June of 1945, approximately 182 dwellings were built every month! Between 1957 and 1960 the entire town that was not directly involved with the Engineer Works (Hanford) production or operation was sold back to the town residents and business owners. From 1947-49 (the baby boomers) was a busy time for Richland. By 1948 over 2,000 babies had been born at Kadlec Hospital and the village had the highest birth rate in the nation. As you drive around Richland when you visit or relocate to this area notice the houses and realize that most of them are part of the village of Richland Washington.